Searching for pressure cooker recipes? You’ve come to the right place! We’re starting from the basics here with tips and tricks and building-block recipes. Once you get the hang of it, try the more involved recipes (they’re still so easy!). If you haven’t noticed, the world is infatuated with the electric pressure cooker. It’s a little kitchen appliance that feels magical at times. It’s nearly hands-off and in my opinion, produces a better result than the slow cooker most times. If you’re wondering, “how do you cook in a pressure cooker?” you’ve come to the right place. 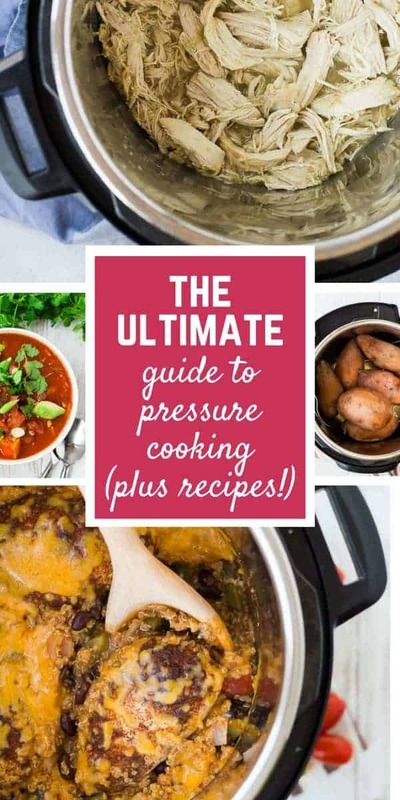 Included in this list are lots of super basic pressure cooker recipes to get you started and once you get those under your belt, you’ll feel like an expert! At the end of this post, I’ve included answers to frequently asked questions as well as some equipment and resource recommendations. I’m always dreaming up new pressure cooker recipes and recipes for the Instant Pot, so if you have any recommendations, make sure to send them my way! READ THE MANUAL. I could just leave it at that. You should always read your manuals – I’m completely type-A so you don’t have to tell me twice to do this, but I know not everyone is like me. Give it at least a quick skim so you learn the basic process for using your specific pressure cooker. When you quick-release the pressure, make sure you’re standing back and not leaning over the valve. The steam comes out fast and hot, so keep your distance. That’s really it – please follow the safety instructions in your manual! 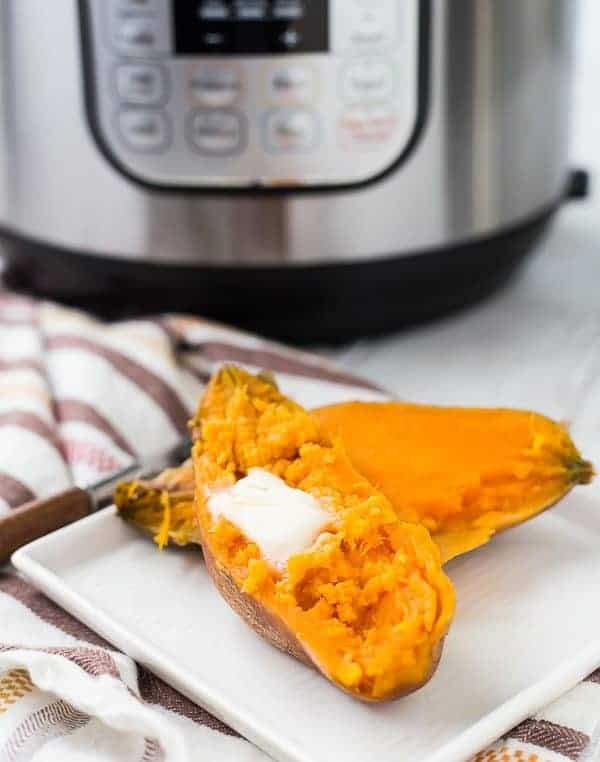 Instant Pot Sweet Potatoes: Soft, silky sweet potatoes in less than 30 minutes? Sign me up! You guys will love these for meal prepping! 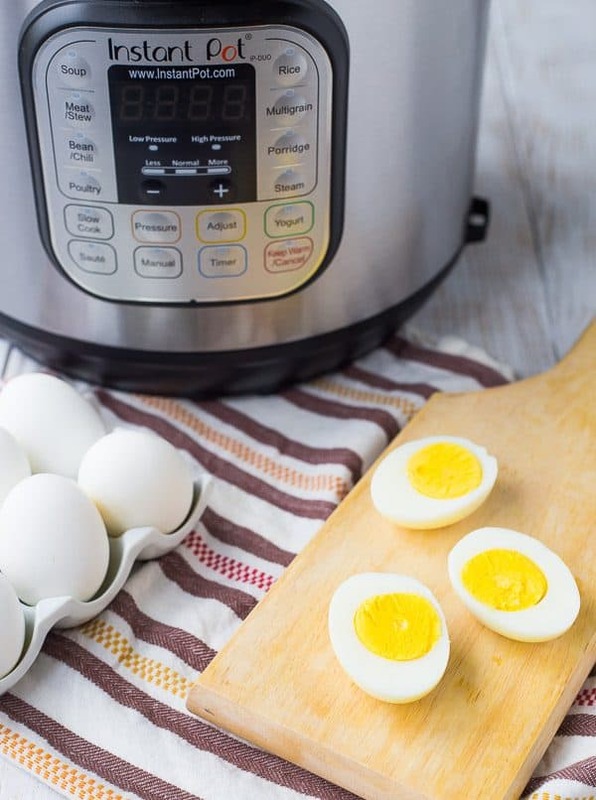 Instant Pot Boiled Eggs: Using your pressure cooker to “boil” eggs is a total game-changer! Never again will you struggle with peeling a boiled egg. Instant Pot Shredded Chicken: This is such a great method of cooking chicken. It’s fast and the chicken has a better texture than chicken cooked in a slow cooker. In this post, I cover four easy recipes, each with only two ingredients. This chicken is great for salads, soup, burrito bowls, enchiladas, tacos, sandwiches, and more! How to Cook Spaghetti Squash – Includes an Instant Pot method! Instant Pot Jasmine Rice – the very best kind of rice, in my opinion! Instant Pot Baked Potatoes – Just like sweet potatoes, perfect every time! 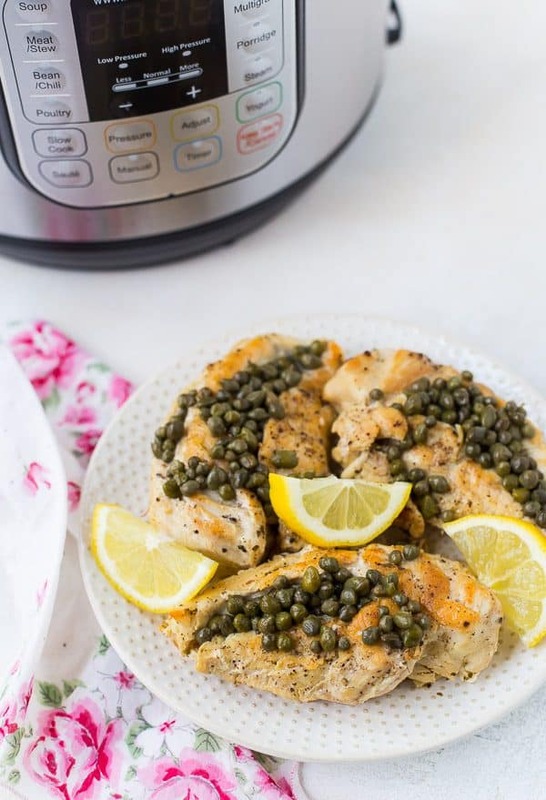 Healthy Chicken Piccata: All the fantastic flavor of Chicken Piccata, except made a bit healthier. Plus it’s done in a fraction of the time thanks to the pressure cooker! Instant Pot Chicken Marsala: This one is one of our favorites! 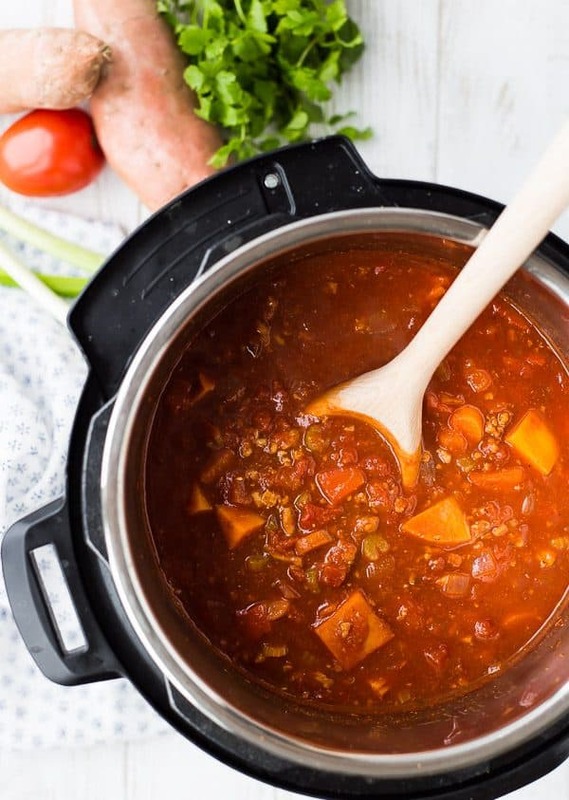 Instant Pot Chili: This one is Whole30 compliant and paleo, but I also give you instructions to make it vegetarian, how to add beans, and instructions to help you make it in the slow cooker or stove top. It’s perfect as is, but the possibilities are endless with this one! Southwestern Instant Pot Chicken and Quinoa: Filling and hearty, this flavorful mixture will be your new best friend at dinner time! Instant Pot Farro Stuffing: This makes a fun stuffing on Thanksgiving, but it’s also great as a main dish, too! Try sprinkling some pecans or walnuts on top for added crunch. Instant Pot Pasta with Sausage, Spinach, and Tomatoes: A full meal, all in one (Instant) pot! Instant Pot Chicken Noodle Soup: Good for the soul! What’s good in a pressure cooker? So much! The pressure cooker makes the best hard boiled eggs that always peel perfectly. It cooks chicken breast without turning it to mush like the slow cooker does. It makes tender ribs and roasts. Grains and rice cook perfectly. Dried beans require no soaking. It’s such a versatile kitchen tool! Well, that depends. If you’re cooking spaghetti squash and boiled eggs, yes. If you’re making macaroni and cheese, not as much. 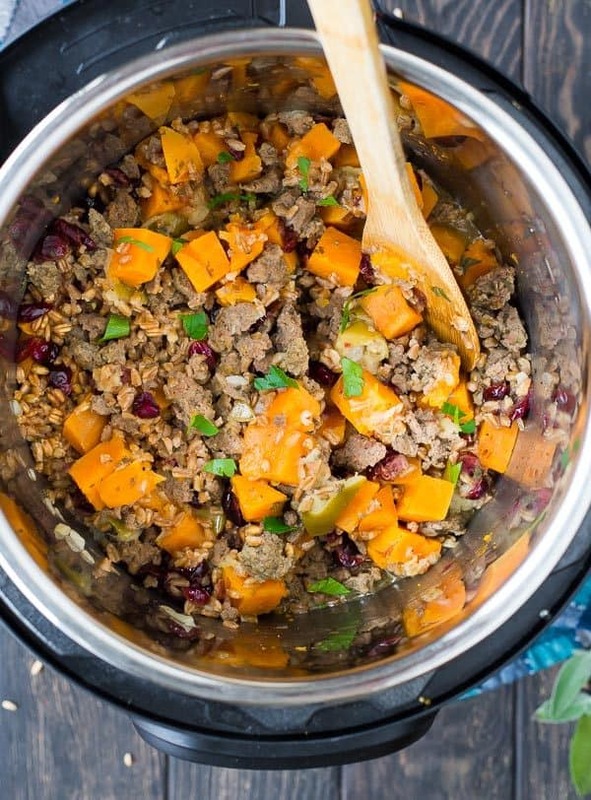 There are so many great healthy recipes that you can cook in an Instant pot so it really is a great method of cooking healthy food. I love my Instant Pot – the 6qt is the most common size. If you have a larger family, you might want to get the bigger size (8qt), and if you have a smaller crew, there is also a mini one (3qt) available. There are other brands of pressure cookers as well (Crock Pot makes one), but I haven’t tried any brand except the Instant Pot. What is a good pressure cooking cookbook? What extra equipment do I need for pressure cooking? Steamer basket – this one would hold a lot, this one is more basic. Stackable pans – if you want to cook more than one thing at a time, these would be a perfect solution! Silicone cover – not entirely sure how much I’d personally use this, but it would be nice if you were cooking at home and bringing the food somewhere. New rings and inserts in case you need replacements! Do you have requests for pressure cooker recipes or any more questions? I’m happy to help – send them my way!